Will cattle, pigs and food for faifeau be taxed too? An interesting story jumped out for attention on page 3 of the Weekend Observer of 4 November 2017. Titled “P.M. deflects criticisms of taxing envelopes for pastors,” we say it was unusual for the simple reason that P.M. Tuilaepa Sa’ilele Malielegaoi is not one to dodge anything. That’s just not his style – from what we know at least. He would usually confront anything head on and whether we like it or not, he wouldn’t care. The issue in question is the government’s decision not to just tax members of the clergy but also tax the gratuities traditionally given to them when they officiate birthdays, weddings, funeral services and many other forms of fa’alavelave. These can range from $100 to $10,000. Well the Pastor has a point. The fact is if what he is saying is the truth, then the government clearly lied during the consultation process. In a country that recently declared itself as an official Christian state, this is a big one. Especially when it involves people who are often referred to as God’s representatives on earth. Now this has angered many church members. Village Mayor of Fagasa, Faitau Tuitama, is among them. “The government is destroying our pastors who are feagaiga in villages and we have to take care of them – they are servants of God,” he said. “How come the people of Samoa were not informed that the gifts for pastors for performing funerals, weddings, opening ceremonies etc. would be taxed? “How come ministers and government officials don’t get taxed when they attend funerals, birthday and other services where they are given monies? Another Village Mayor, Moeautolo Filipo, of Safua, supported his colleague. He said it’s sad to hear how the government went on with their plans without proper consultations with churches. “There’s no doubt that the government is everywhere looking for money to survive. I think that’s why they are hiding this action of collecting money from other services that pastors provide,” Moeautolo said. “The burden ends up on people’s shoulders. You see, people’s money that they give to the church have already been taxed and now the government is coming from the other way around to double tax people. We couldn’t agree more. Whatever way the government taxes pastors and the church, it will ultimately fall on the shoulders of members of the public who are already being taxed to the bone. 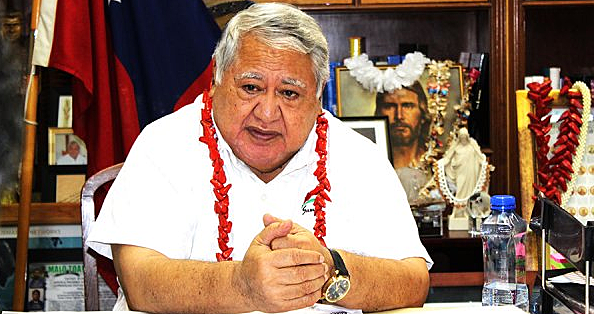 Now when P.M. Tuilaepa was asked for a comment, it appeared as if he was tired so that he simply took a nice sidestep and deflected the criticism. “That decision lies with the Ministry of Revenue,” he said. Really? Is this yet another case of ‘do what we tell you but don’t do what we do’? In any case, perhaps if this government is so desperate for money, they could even tax the cattle, pigs and food received by the faifeau. That would probably make them happier. What do you think? Write and share your thoughts with us!